Slow-smoked and chock full of natural juices, each ham is carefully trimmed, hand-glazed and spiral sliced for convenient serving. A lot of ham for a sweet price! Cured with sweet golden honey and natural juices, and a generous glaze of golden honey and sugar. Half Ham 8-10 lbs. Serves about 16. Cured With: Water, Contains 2% or Less of Dextrose, Salt, Potassium Lactate, Corn Syrup, Sodium Phosphates, Brown Sugar, Sodium Diacetate, Sodium Erythorbate, Sodium Nitrite. Glazed With: Sugar, Honey, Water, Gelatin, Paprika, Dextrose, Spices, Natural Flavorings. Serv. Size: 3 oz(84g), Amount Per Serving: Calories 160, Fat Cal. 70, Total Fat 8g (12% DV), Sat. Fat 3g (15% DV) Trans Fat 0g, Cholesterol 45mg (15% DV), Sodium 800mg (33% DV), Total Carb. 8g (3% DV), Dietary Fiber 0g (0%DV), Sugars 7g, Protein 14g, Vitamin A (0% DV), Vitamin C (0% DV), Calcium (0% DV), Iron (2% DV). Your ham has been flash frozen to lock in natural flavor, ships with dry ice in a recyclable Styrofoam cooler and may arrive frozen or partially thawed. Please refrigerate or re-freeze upon receipt. 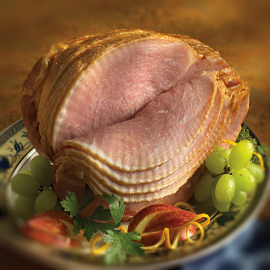 Spiral hams may be refrigerated for up to 7 days or frozen for 3 months and still maintain maximum flavor. 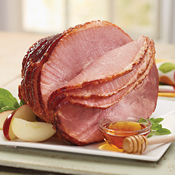 Under Refrigeration: Allow approximately 5 hours per pound to thaw a spiral ham in the refrigerator. 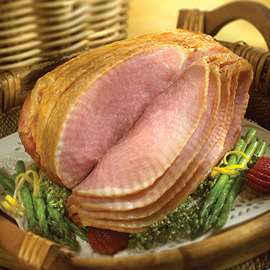 Our spiral hams are fully cooked and by using this method may be refrozen without additional cooking. Quicker Cold Water Bath: For faster thawing, place ham in a leak proof plastic bag and immerse it in cold water. (If the bag leaks, bacteria from the air or surrounding environment could be introduced into the food. Tissues can also absorb water like a sponge, resulting in a watery product.) Check the water frequently to be sure it stays cold. Change the water every 30 minutes. Approximate thawing time for a ham is approximately 30 minutes per pound. Please note - we have changed our heating instructions to enhance the cooked product quality (more moist, less dry). Preheat oven to 275°F. Remove all packaging materials and place ham in a shallow roasting pan. Half hams should be cooked flat/face side down. Cover pan tightly with aluminum foil. Bake at 275°F for approximately 15 minutes per pound, until heated through. Do not overcook! Remove ham from oven and let stand 20 to 30 minutes before serving. This ham is pre-glazed and does not require additional instructions for glaze preparation. Cut along the natural seam on the top (as it faces you), extending knife point as far back into the ham as you wish to remove slices and then down and to the left, parallel to the bone, exiting at the natural seam. Then make a second cut along the top (where the first section was removed) parallel to the bone, around to the right and exiting at the natural seam. To remove the final section, cut down to the right, and parallel to the bone until the section is free. An impressive center-of-the-table entrée or focus of a buffet. Perfect for sandwiches, biscuits, in salads or omelets. Use the bone and leftovers to season soups, beans, or vegetables. Delicious for breakfast, lunch, or dinner. I too purchased a competitors "famous" ham and was so disappointed at both the cost and the quality. Looking around the internet for dressing (btw-it's wonderful! ), I saw a sale on this ham. I decided to give it a try since it was so reasonably priced-but not expecting anything out of the ordinary. What a great surprise! This is a flavorful, juicy, lean ham and the best one I've purchased in years. I highly recommend you try it! Got this ham for Christmas and followed the preparation instructions, it turned out great. After eating all the slices my wife used the bone and ham to make navy bean soup. Rest of family said it was the best bean soup she ever made. Last Christmas we paid $83.00 at a temporary location in Panama City FL for a "Honey Baked Ham" and it was so awful I had to use the whole thing to make soup. I tried to contact them both on their web-site and by phone and they would not even call me back. I am Now a Smithfield Ham Person and I will not go back. It was so GOOD. And they have excellent customer service too! LOVED, LOVED THIS HAM. SO MOIST & TASTY. I WILL DEFINITELY BE ORDERING IT AGAIN. I purchase this ham several times a year for holiday dinners and its always a hit! Everyone loves it. This ham is full of flavor, tender and never dry. My guests always ask to take home any leftovers. Love it and well worth the price.